More and more of us are trying to reduce their impact on the environment by recycling plastics and paper, choosing efficient appliances and adjusting the thermostat to save energy. But what about your vehicle? Some people choose high-efficiency vehicles and trucks, but even if yours isn’t a hybrid, you can take steps to improve fuel efficiency and reduce emissions. Adjusting your driving habits and staying on top of proper vehicle maintenance are great ways to help you achieve better fuel efficiency and minimize emissions to not only help the environment but your wallet as well. Vehicle maintenance is essential to caring for the environment. Clean filters and lubricants, properly inflated tires and correct engine tuning all contribute to fuel efficiency and even lower emissions. You can be confident your ride is running right by taking your vehicle to your local Jiffy Lube® for scheduled preventive maintenance. Jiffy Lube can help by setting the right tire pressures, servicing and replacing air and oil filters, and making sure the engine and drivetrain components are well-lubricated to minimize fuel-robbing friction. Inspecting the wear pattern on the tires during a Tire Rotation Service may reveal problems like a wheel misalignment that is causing the engine to work harder than it should for optimal fuel economy. Problems that could be costing you money every time you drive. Properly disposing of motor oil is also essential to staying “green”. Improperly disposed oil greatly harms the environment. 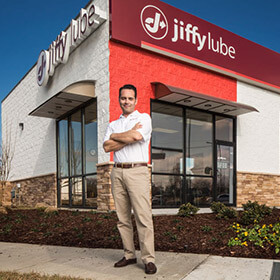 When you get a Jiffy Lube Signature Service® Oil Change, your dirty oil is disposed of properly at Jiffy Lube service centers. And if you change your own oil, most locations will accept and recycle dirty oil even if it wasn’t changed at a Jiffy Lube. Your driving habits are also just as important as properly maintaining your vehicle. Driving the speed limit isn’t just for safety; it also helps your fuel efficiency. According to the EPA, driving 55 mph compared to 65 mph can improve gas mileage by as much as 15%. Using the cruise control can help achieve this, and maintaining a constant speed typically delivers better fuel economy than varying your speed.